Retire in France...the land of van Gogh, Renoir, Monet and other great artists of the Impressionist era await you in France...this is a scene in Provence. You don't need to be told about the great cuisine that awaits you in France, can you imagine yourself having coffee and croissants every morning in a village like this... many do. Sounds like tough duty to me. We took the "Chunnel" train from downtown London to downtown Paris...talk about easy, 90 minutes and you are there. Once you get to Paris the Metro is a breeze...after a day we were pros. 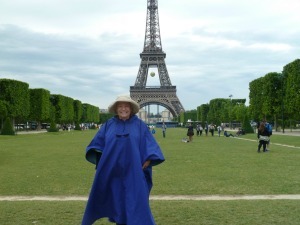 OK so we needed our Goretex ponchos when we took a bike tour of Paris...highly recommended. In fact later on that very day we took another bike tour combined with a boat tour of the Seine...when we came back on the Metro it was packed at midnight...we felt very safe. Safer than Chicago by a factor of 100 in my humble opinion. This is one country where I would say that a working understanding of French is necessary for one to retire in France...The Gallic pride is such that not speaking French could become a problem... 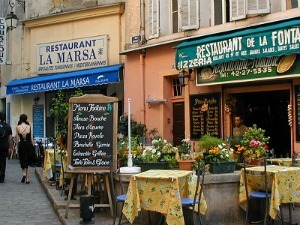 I would suggest software such as Rosetta Stone or an immersion class as number one on your priorities if living in France is on your retirement radar. I could be wrong on this but I don't think so. Here is the Wikipedia link to France. 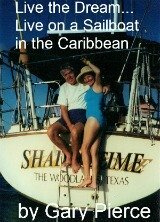 As most of you know, we lived on a sailboat in the Caribbean for eight years...one of our cruising friends spent the winter, like us, in the Caribbean ...like us they hauled the boat out for hurricane season ...and went to live on their river barge in France for the summer. You may want to check out this lifestyle by first renting a river barge for a week or so to see if it's for you.